The broad and principal aim of the Monumenta Liturgica Beneventana is the discovery, study, and editing of medieval liturgical texts contained in manuscripts displaying the distinctive writing known as ‘Beneventan.’ This type of script was first used towards the middle of the eighth century in the Duchy of Benevento (to which general region the hand owes its name), and it was practiced until at least the middle of the sixteenth century (and into the eighteenth in a ‘pseudo-Beneventan’ form). ‘Beneventan’ was written throughout the area comprising the Duchy and also along the Dalmatian coast, the script having been transported there by Benedictine monks who came to found or to populate monasteries. With Virginia Brown’s revision and enlargement in 1980 of E.A. Loew[Lowe]’s magisterial palaeographical study The Beneventan Script (Oxford, 1914), it was abundantly clear that the vast majority of extant manuscripts and fragments in the Beneventan hand were liturgical (nearly 75% as opposed to some 15% of codices in other scripts). The discovery of the Beneventan script’s use as a liturgical script par excellence (not unlike the Gothic type font used for printed liturgical books in the early twentieth century) has been confirmed repeatedly as new items have been found. In studies of the Beneventan liturgical manuscripts it is clear that they reflect not only the ancient indigenous liturgical rite or use known as ‘Beneventan,’ but also the rites and uses of the nearby see of Rome and those of the conquering Byzantines, Normans, and Angevins. Moreover, study of these manuscripts provides a profile of liturgical practice across the ‘Beneventan zone’ from southern Italy to Dalmatia for over eight centuries. The manuscripts of the rite can be localized through references to saints and other specific names contained therein, and these manuscripts can then be compared and contrasted. In short, the liturgical rites practiced in the ’Beneventan zone’ display an astonishing diversity and reflect the political, social, and cultural complexity of the south Adriatic region in the Middle Ages. The study of the ritual practices of this region within the program of the MLB has a number of related objectives. First, the discovery of hitherto unknown Beneventan manuscripts and fragments in European and North American depositories. Almost 2,000 of these were unknown to E.A. Lowe. Second, microform and photographic holdings of appropriate manuscripts have been and are being expanded so that the collection at the Pontifical Institute is now the most extensive in the world, so much so that foreign scholars visit the Institute to consult these reproductions and frequently write for information. Third, virtually all the liturgical codices in Beneventan script found thus far have been described codicologically and palaeographically according to an internationally accepted model adapted to the program’s requirements. One of the exciting byproducts of these descriptions has been the ’joining’ of many membra disiecta scattered throughout the world. Fourth, transcriptions of the liturgical texts in the manuscripts are being entered into a repertory, and this repertory is being and will be used in the fourth objective of the program, namely, critical editions and studies of the various types of liturgical books in Beneventan script. A fifth objective of the program is to use the edition and study of manuscripts in Beneventan script as a means to train graduate and post-graduate students in the various disciplines they must master as medievalists: codicology, palaeography, ecclesiastical and secular history, liturgy, music, ecclesiastical law, and art history, to name but a few. The shorter discoveries of these students have been published in the “Miscellanea Beneventana” section of the journal Mediaeval Studies. To date there have been ten licentiate and doctoral theses at the Pontifical Institute and University of Toronto on Beneventan-script topics. A sixth objective of the program is cooperation with projects or programs beyond Toronto engaged in the study of topics involving Beneventan-script codices. For example, members of the MLB have cooperated with Dom Jean Mallet, OSB, and Dom André Thibaut, OSB, in the compilation of their monumental catalogues of the Beneventan-script codices in the Biblioteca Capitolare in Benevento; with the Fondation Royaumont in France in the study of the music and culture of the cathedral of Benevento; and with the Kanones CD-ROM project of Linda Fowler-Magerl in Germany listing incipits/explicits of all canon law texts from the early eleventh through the mid-twelfth century. Further, because of their scholarship in matters touching Beneventan script, members of the MLB have been asked to teach courses and seminars in Europe for the benefit of colleagues and students. Results of the program continue to be disseminated to the scholarly community principally through two refereed channels sponsored by the Department of Publications of the Pontifical Institute of Mediaeval Studies. Shorter studies on the manuscripts have been and will continue to be disseminated in the refereed journal Mediaeval Studies. Longer studies and editions have been and will continue to be published in Studies and Texts in the subseries Monumenta Liturgica Beneventana (for a list of publications, see below). Because it is important that the work of the MLB be known in publishing outlets in other countries – especially when editors of refereed journals, catalogues, and collections of essays welcome submissions from its members – articles will also continue to be placed in these outlets in both Europe and North America. In addition, the investigators will continue to communicate their results verbally (often with powerpoint) in several forums. Members of the MLB continue to participate in learned conferences and workshops and to present lectures, seminars, and courses both in Canada and elsewhere. Communication of results outside of the scholarly community continues in several forms: scholarly assistance in the production of manuscript sale catalogues of Beneventan-script items, such as those of Bernard Quaritch and Sotheby’s; the publication of manuscript exhibition catalogues such as I Fiori e’ Frutti santi: S. Benedetto, la Regola, la santità nelle testimonianze dei manoscritti cassinesi (Montecassino, 1998); presentation in the media (national television, radio, and the popular press) of liturgical items in Beneventan script; public displays in the institutions of the investigators of research carried out in the program; and displays of Beneventan manuscripts, facsimiles, and research results and publications at such well-publicized events as the fundraising dinner for the Pontifical Institute in 1995 honoring Sir Peter Ustinov, Gerald Emmett Cardinal Carter, and Douglas Bassett or the colloquium and exhibition at the Pontifical Institute in 1999 of manuscripts from Montecassino, ‘Treasures of Montecassino,’ accompanying the awarding of an honorary degree to don Faustino Avagliano, OSB, Archivist and Prior of Montecassino. With the untimely death in 2009 of Virginia Brown, generally acknowledged as the world’s foremost expert in the Beneventan script, the program is being carried on by the remaining principal investigators with the generous and continued support of the Social Sciences and Humanities Research Council of Canada. To the objectives listed above, several new ones have been added. First, Virginia Brown left a host of projects unfinished, and these are now being completed by the remaining principal investigators and by professors who studied with or knew Virginia Brown. Included among these is the volume Virginia Brown, Beneventan Discoveries: Collected Manuscript Catalogues, 1978–2008, ed. Roger E. Reynolds (Toronto, 2012). Second, copies of Virginia Brown’s vast collection of notes on and microforms of Beneventan-script manuscripts are being maintained in a newly established Archivum Scripturae Beneventanae at the Pontifical Institute. These are augmented by volumes, microforms, facsimiles, and notes belonging to Roger Reynolds and by the large collection of Beneventana in the Library of the Pontifical Institute. These may be consulted by scholars who are interested in them. 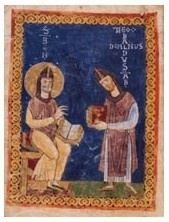 Third, to extend the outreach of the MLB its members have been instrumental in creating an international Society for Beneventan Studies that sponsors lectures and conferences and cooperates with scholars and institutions in Italy and Dalmatia specializing in the study of Beneventan manuscripts. ✝Virginia Brown (AB, Manhattanville; MA, North Carolina; PhD, Harvard; Arch. Pal., Vatican). Senior Fellow Emeritus at the Pontifical Institute of Mediaeval Studies, and Professor Emeritus in the University of Toronto; Former Editor-in-Chief of the Catalogus translationum et commentariorum; former editor of Mediaeval Studies; author of numerous publications on Beneventan-script topics, palaeographical studies, and classical and Renaissance subjects. Richard F. Gyug (AB, Carleton University; MA, PhD, University of Toronto; MSL, Pontifical Institute of Mediaeval Studies). Research Fellow at the Pontifical Institute of Mediaeval Studies, and Professor at the Department of History, Fordham University. Author of numerous publications on liturgical books in southern Italy and Dalmatia, and social history in medieval Catalonia. ✝Roger E. Reynolds (AB, PhD, Harvard; JD, University of Chicago Law School). Senior Fellow Emeritus at the Pontifical Institute of Mediaeval Studies, and Professor Emeritus in the University of Toronto; author of over 300 publications on medieval liturgy, law, and clerics and clerical orders in the Middle Ages; frequent lecturer in Europe and North America, and television and radio guest. Research results of the MLB project are published in a separate sub-series by the Pontifical Institute. There are 6 volumes in print, listed below. Two new books are forthcoming: Neo-Gregorian Chant in Beneventan Manuscripts, by Luisa Nardini (University of Texas at Austin) and The Bishop's Book of Kotor: An Edition and Study of Sankt-Peterburg, BRAN, F. no. 200, by Richard Gyug. Missale Ragusinum: The Missal of Dubrovnik (Oxford, Bodleian Library, Canon. liturg. 342). Ed. Richard Francis Gyug. ST 103; MLB 1. 1990. The Necrology of San Nicola della Cicogna. Ed. Charles Hilken. ST 135; MLB 2. 2000. Roger E. Reynolds. The Collectio canonum Casinensis duodecimi saeculi (Codex terscriptus). A derivative of the South-Italian Collection in Five Books. An implicit edition with introductory study. ST 137; MLB 3. 2001. Charles Hilken. Memory and Community in Medieval Southern Italy: The History, Chapter Book, and Necrology of Santa Maria del Gualdo Mazzocca. ST 157; MLB 4. 2008. Collectio Toletana: A Canon Law Derivative of the South-Italian Collection in Five Books. Ed. Douglas Adamson and Roger E. Reynolds. ST 159; MLB 5. 2008. Virginia Brown. Beneventan Discoveries: Collected Manuscript Catalogues, 1978–2008. Ed. Roger E. Reynolds. ST 179; MLB 6. 2012.